The 33-year-old suspect in the cold blooded murder of the 51-year-old Sarah Mwilima in an office occupied by officials from the Ministry of Health and Social Services in Windhoek on Monday did not make his first appearance in court on Tuesday. As far as could be established the man who currently in police holding cells after surrendering himself to police shortly after the shooting incident is charged with one count of murder and one count of attempted murder and is also likely to face firearm related charges. The commander of the Police Public Relations Division, Deputy Commissioner Edwin Kanguatjivi, said the suspect will definitely be charged with murder and attempted murder or a second count of murder, should the second victim succumb to the injuries she sustained. The suspect stands accused of murdering Sarah Mwilima in cold blood after he shot and killed her at point blank range before shooting a second woman, Ester Nepolo, who attempted to stop the killing from taking place. In the meantime Nepolo has undergone emergency surgery to remove a bullet from her chest and the last report from her husband stated that she is in a stable condition. Simasiku was arrested after he surrendered himself to police on duty at the Wanaheda Police Station shortly after the shocking shooting incident in the central business district of Windhoek on Monday. Prosecutors at the Windhoek Magistrate’s Court said upon inquiry that the Namibian Police did not bring the case docket to court early on Tuesday morning and indicated that investigators are still gathering statements from people who witnessed the brutal killing in the City Centre Building on Monday. Shortly after the shocking incident, Commissioner Silvanus Nghishidimbwa, the Namibian Police’s Commander of the Khomas Region, said that the motive for the killing still has to be established. He gave the assurance that the matter will be investigated with all possible diligence. 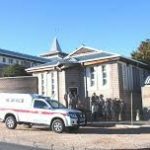 It is expected that the Namibian Police will deliver the case docket to the state prosecutors later today or early on Wednesday morning and that the 33-year-old suspect will make his first appearance then.